It's hard to pick a favourite place we visited in Japan, but I must say Kyoto is right up there at the top! The size of the city, the history, the temples. And we had the best ramen of our trip there, so obvs that's the most important. And more amazing food. But before we get to Kyoto, we tick off another highlight of our checklist (especially Chris' list) which is taking the Shinkansen. We got a weekly JR rail pass, which served us an absolute treat. You can take most trains throughout Japan, there is only 2 exceptions: one of which we of course managed to try and take. Thing is, if you can't read Japanese it proves quite difficult to figure out which train you can't get on. But besides that, the Shinkansen is an absolute joy to travel on! I don't have to tell you it's super quick (320 kms / h), it's so clean, so on time and such a great place to enjoy one of the bento lunch boxes you get from the stations. (DO) Order a JR Rail pass well in time before you leave on your travels. The pass is only available for tourists, and they send it to your home address. Cleaners waiting in line to give the Shinkansen a once over before departure, in the best coloured outfits I've ever seen! Accommodation in Kyoto is something that needs to be booked as soon as you know you're going, as it gets booked up very quickly, especially on the weekends and during holidays. We stayed at Hotel Gracery, a lovely modern, clean hotel filled with Muji items and Shiseido products, and very central. A great location to explore from, and very helpful staff. 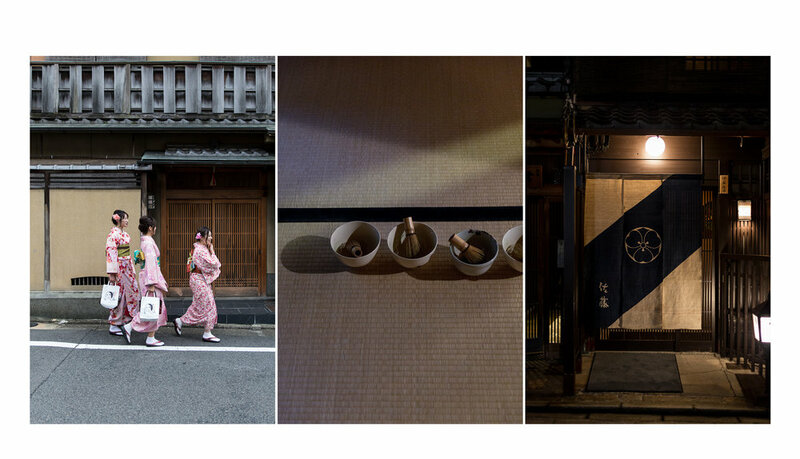 Arriving in Kyoto, it's 'town like' feel is a breath of fresh air after Tokyo's madness. We walk from the station to our hotel, through little streets filled with bikes and boutique shops. The local feel instantly makes us feel at home. After wandering around Nakanocho, exploring the small shops around there, we worked up an appetite for something we've been looking forward to since we got it recommended by our friend Nick who lives in Japan: Ramen Sen No Kaze. Apparently one of the best to be found, so popular you have to turn up early otherwise they might have sold out. Let's start with what it all is about. This was probably the best Tonkotsu ramen we had this trip. The broth is so creamy, rich and has a hint of smokiness, the pickled egg soft and savoury, the pork melt in the mouth delicious. Back here in Europe I'm not the biggest fan of pork (unless it's bacon, that's a different story altogether), as I generally find it quite a tough, flavourless meat, but somehow all the pork that we had in Japan seems to come from a different planet! Or I'm just hoping they have generally had a happy life, and that's why you can taste the difference. We had the Kyo no Shio Issui that comes with out of this world gyoza and a lovely refreshing beer. What else would you want? We came across this place by accident. We wanted to try Kichi Kichi Omurice, but as we were in Kyoto for the weekend, it was absolutely impossible to get a reservation, so we decided to stroll the streets and just pick somewhere for dinner. And it turned out to be the best choice! No overpriced omelette for us, but beautiful fresh tuna with radish, Wagyu beef, veg tempura, gyoza, my pick of the menu: tofu curd skewers, since I like to try the unknown, and much more. The couple next to us laughed at the amount of food that was piled onto our table, and the stream of new dishes didn't seem to stop. We combined it with some beautiful sake, which was also laughed upon as you drink sake in winter, not in September. But heck, when in Rome.. I mean Japan..
Well, this one is a bit of a guilty pleasure. We're both such suckers for gyoza, that we fancied an entire meal of them. Tiger Gyoza is a bit of a chain, but that didn't mean the gyoza weren't good. In fact, it was a perfect way to satisfy our dumpling hunger. We ordered several different ones, from steamed to fried (one comes as a crispy circle of gyoza) and some side dishes like mapo tofu. YUM. If you like food, you should go to Nishiki market. Simple. Everything from korokke to pickles, seafood to handmade knives. It was incredibly hard for me not to blow our entire holiday budget here, especially after seeing the talented people make those knives! Kyoto is filled with breathtaking temples (apparently close to 1600 of them! ), and we only managed to visit two of the main ones during our time here, one of them being Kiyomizu-Dera. But it's not just the temple that special, as we found. We walked from Gion, via Kennin-ji towards Kiyomizu-Dera, and on the way stumbled onto the beautiful old streets of Ninnen-zaka and Sannen-zaka. Walking through here you feel like you've stepped back in time, as it's filled with old Japanese wooden buildings, stacked along the sloping streets that lead up to the temple. It's also the perfect spot to try some of the hundreds of snacks on offer, like freshly made rice crackers in all sorts of flavours, sweets or potato korokke (the Japanese version of, you guessed it, the croquette). Right: the best fresh rice crackers! Arriving the top, you find yourself at the entrance to the temple. Part of it can be visited for free, but I'd recommend paying the entrance fee and having a look around the inner temple grounds. The history of the buildings is astonishing ( it's a UNESCO World Heritage Site), there are lot's of different buildings to admire within the grounds, and you get to enjoy a pretty stunning view over Kyoto from the mountainside. Fun fact: the main temple is constructed without using a single nail! This was the second shrine we visited, world famous for it's enormous amount of 'torii' . The streets leading up to the shrine are again filled with lot's of mouth watering foods, and the shrine itself is overwhelmingly beautiful. As we went on the Sunday, it was absolutely packed, so after admiring the torii we quickly escaped into the bamboo forest in the shrine, and then headed to the nearest coffee shop Vermillion. Tucked away near Fushimi Inari, this was a great find and an oasis of calm. Fantastic coffee, overlooking a small lake. For my British tea loving readers, this is your chance. I know, our tea habits are not to be compared to the Japanese ones, but I'm sure to say that both nations have a bit of a passion for the drink. Kyoto is the center of the tea ceremony, and if you have a chance, it's a beautiful, meditative experience. I haven't seen the same named film, but when I read the book it made a long lasting impression on me, even though it's a fictional story. It has probably unknowingly triggered some of the fascination I have for Japan, as it talks about the rituals of the country, as well as the history and culture. It left such a mysterious and magical feeling with me, and I was curious if I would rediscover this feeling when walking the streets of Gion. And I did. Walking around the little streets of the area described in the book, especially Hanamikoji Dori, at night gave me a feeling of stepping back in time. The cobbled streets, lit by small dimmed lights, are quiet, yet you can see silhouettes moving behind the rice paper sliding doors of the wooden houses, accompanied by the sound of laughter. It's like you are passing through this other dimension of the city. If you are really lucky, you might spot a geisha or maiko (apprentice geisha), rushing from door to door. We were so very lucky to see two, in the most beautiful kimonos I've ever laid my eyes on, carefully created hairstyles and with the intriguing nape make up. I can only speak in words here and not in images, as it's considered very inappropriate and rude to photograph a geisha. This is part of the reason why they are very shy, and try not to spend too much time out on the street. When you get to Kyoto you might feel like you see geisha everywhere, but you will soon find out these are mostly Asian tourists dressing up in kimonos for the day. As one of the hotel staff taught us: if you see them strolling, and taking selfies, they are not geisha. A true geisha tries to stay as unnoticed as possible, and is very shy. So if you want to see them, make sure you head to the backstreets in the evenings (when they entertain), and keep your eyes open!